Check whether you allowed access to your camera. Click the camera-icon in the URL to check whether the right webcam has been selected. Check if other programmes (e.g. Skype) are blocking the webcam. Download the 'video chat by 24sessions' app. The above issue may appear if you have not allowed access to your microphone and/or camera. In Google Chrome (top left): you can find the instructions from the Systembot at the left side of the video chat room (red circle). In Mozilla Firefox (top right): you can find the instructions from the Systembot on the left side of the video chat room as well and the camera-icon and its settings in the top left corner of your browser (red circle). Check whether you have selected the right camera in your web browser by clicking the camera-icon as described above (Chrome top right; Firefox top left). Click the right arrow for the scroll down menu to see a list of available devices. Make sure to select the right camera and click 'Allow'. Hereafter, please reload your internet browser by clicking the refresh button 🔄 (Chrome top left, Firefox top right next to the search bar). Check whether other programmes are picking up your camera and/or microphone by making sure you are logged out of them. 6. Download the 'video chat by 24sessions' app. 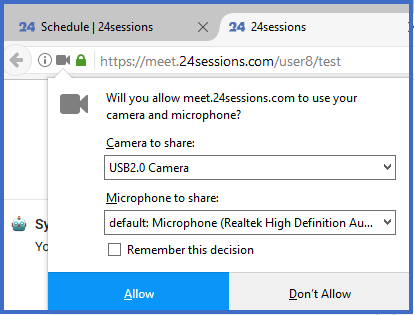 As a client (and thus not as a user) it is also possible to participate in the meeting via the 'video chat by 24sessions' app. You can download the app from both the App Store or Google Play. Enter the access code that was sent to you via mail to enter the video chat room.